I have been on the road for thirty-plus years and have never lost a pound while traveling. My biggest worry whether I am on a business trip or a vacation is how much weight I will gain. This past week I took myself on a healthy vacation to one of the most incredible places I have ever been, and believe it or not I ate really well and lost two pounds. I went to Sanoviv Medical Center and Health Resort, where they teach you that people are responsible for their own bodies. It isn’t up to a pill or a shot. I flew into the San Diego Airport, where I was met and driven to Rosarito, Baja California, Mexico, about 30 miles from the USA/Mexican border. As I arrived a big gate opened, and when I got into the resort I thought I had gone to Paradise. 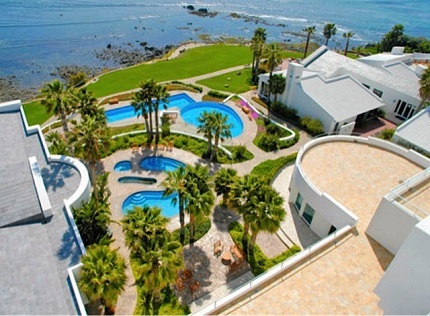 Once I was registered I went to my room on the eighth floor, which looked out over the five pools at the resort, and a beautiful walking path to the Pacific Ocean. Every night I opened my glass doors to a patio so that I could enjoy the sound of the rolling waves as they came into the shore. Here is the view from the eighth floor. My first stop was to visit the chiropractor. Last time I was at Sanoviv I shared with him an ache that I had in my shoulder. He gave me some exercises to do in the pool and it went away. This time it was a muscle in my foot that had been driving me crazy for the past two years. I had gone to all sorts of doctors in the States, but none of them could do a thing to help me out. After he checked it over he gave me some more exercises. He then gave me the bit of advice that I will never forget. He said, “The body responds to consistency.” I got it. The bottom line as far as the body is concerned is up to me, and if I do not do my part the body will not do its part. As we talked I told him that I had been so busy that I had neglected some of my exercises since January. He then gave me the next gem. He said, “Time is a tool not and excuse.” That one hit me square between the eyes. How many times have I said I just did not have enough time. Since I have gotten home I have said no to a lot more things so that I could say yes to what I need to do to take care of myself. As I learned at the clinic, I’m the one who has to do the work to keep myself healthy. It isn’t up to a pill or a shot. While at Sanoviv I attended every class I could about how to create a healthy lifestyle. Every day I could go to yoga, meditation, exercise programs, food preparation and more. Each night one of the professionals (medical doctors, dentists, chiropractors, nutritionist, physical fitness and psychologists) gave a presentation about his area of expertise. One of my favorite classes was given by Dr. Lance Agorda. He took us on a journey through the digestive system with the descriptive photos so we could see what happens when food enters our mouth. After his presentation I work to chew every bite 30 to 50 times so that my food is soup in my mouth mixed with all the good enzymes that will break it down in the body. He said if you do not eat healthy food, all the supplements if the world will not make you healthy. I thought that was right on. I know we do not know about all the good things in healthy foods. David Gonzalez came in and demonstrated massage. He had a man lie face down on a massage table. He then pulled both of his legs down to see which leg was longer, and one leg indeed hung down longer than the other. David had also marked the height of the man on a paper taped to the wall. He told us that his spine was to the right side. He then went about moving the spine over bit. Then he pulled his feet down again and they were even. When he stood up we could see from the marks on the wall that the man was about a half inch taller. I said to myself, “I want that done to me.” I made an appointment with David. When he pulled my feet down, he said that there was about an inch difference in where they ended. No wonder I have limped for so long! I thought it was because of my bad knee. After he straightened my spine he checked my feet and they were even. My limp went away because I was straight again. The program that I attended lasted five days and my schedule was filled with opportunities for me to learn. Some of the food demonstrations that I enjoyed were sprouting, juicing, and how to make tortillas with yellow pepper, squash, and flax seed flour. One new exercise for me was earthing, which is a practice of walking barefoot on the grass. I felt like I was a kid again as I went out to walk on the grass to get the good energy that comes from the earth. I came home I googled it. Sure enough, there were a lot of articles on the benefit of walking in the grass with bare feet and reconnecting with the energy from the earth. After my five days of taking in good health, I came home with a renewed desire to put myself at the top of my priority list. I know that when I do nothing I rust, and if I take care of myself I will enjoy the wonderful life that I can create with a healthy body, mind, and spirit. For more information about Sanoviv email info@dianthomas.com.